Sandra’s booth at the 2016 Newfoundland Kids EXPO. I started hand sewing Barbie clothes when I was 10 or 11, and graduated to real-people clothes when I learned to use a sewing machine in junior high. Since then, I’ve sewed just about everything: costumes, fashions, quilts, drapery (! ), stuffed animals. I had my own visual merchandising business for about ten years, that was fun! My nieces got me back into doll clothes. I babysat my youngest sister’s first baby girl; then when that little girl was two, my sister had twin girls! Auntie’s hands were full. Another sister introduced us to the American Girl catalogues. We spent countless hours cutting out the dolls, gluing them to cardboard and playing. They each got dolls when they were ten and I started sewing for them. I realized as they got older and more independent, that I would soon be out of a job. What to do? What to do? Hey! I could sew! Doll clothes! There was definitely a demand, but no local supply. The deciding factor was discovering Liberty Jane patterns. We started again in earnest the following Spring. I love fabric and sewing: always have, always will. The joy of watching my nieces with their AG dolls got me started. The challenge of a new fabric or pattern keeps me going. One thing I try to do is copy the AG GOTY “meet” outfit – it tickles me when the little girls recognize it. My main focus is my online store, but I do one show a year – the NL Kids EXPO – in early June. Then I have six weeks of Saturday afternoon Open House Sales in my home in the Fall. One fun doll experience was a repair to ‘Chavonne’, a Journey Girl doll. Bad boys had ripped her apart, splitting her fabric body. I carefully took her apart, used her destroyed cloth body as a pattern and stitched her back together (by hand). Re-stuffed, she was as good as new, and sent home in a new nightgown with strict instructions, never play with bad boys again! The little girl and her grandmother were delighted. 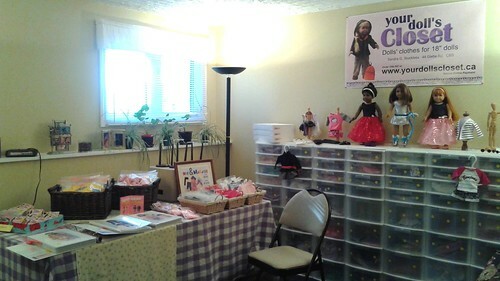 Sandra’s showroom/shop for her Open House sales in the fall. Sandra has just about anything you would want at her online store, dolls, doll funiture, a variety of boy and girl clothing and accessories, not only that she will also do custom orders. 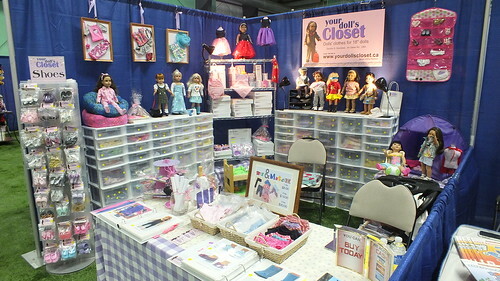 If you can’t make it to the NL Kids Expo this June, be sure to check out Your Doll’s Closet online and see what is available, my personal favourite are the newsboy caps and her custom Newfoundland doll, you gotta see her! Tags: 18'' Dolls, Canadian. Bookmark the permalink. I am new to making doll clothes, and when I was home in Newfoundland in January, I contacted Sandra to see if she would be willing to meet with me and share her expertise. Needless to say, she was more then welcoming! We spent almost three glorious hours together, and her advice and suggestions were fantastic! Lovely, talented lady! 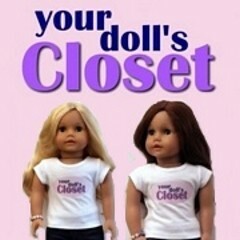 Everyone should visit her site “Your Dolls Closet” you won’t be disappointed!